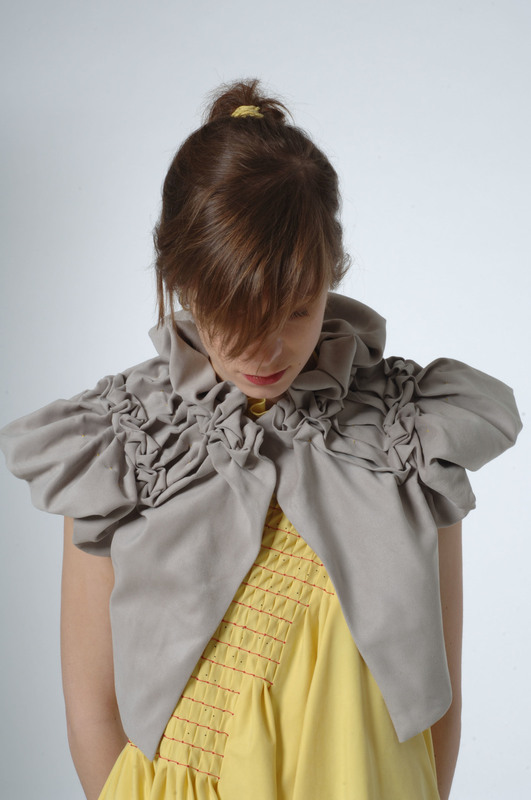 An exploration of cut-to-fit and draped forms. In a series of prescribed abstract tasks to work with geometrical shapes and structures in various scales, several toiles were made. It is an intuitive process of shaping garments by working closely or loosely on the dress form, exploring fit, drape and movement. Sensing what a garment makes the wearer feel is crucial: does the garment embrace you, hold you, protect you? Does it lift you up, does it make you want to sway and swirl? The unexpected outcomes of this partly conceptual, partly organic approach are fully embraced and from the full-sized and partial samples a selection was made up and assembled into two looks.